Pro Evolution Soccer 2019 (or PES 2019) is the next yearly instalment in Konami’s annual football simulation franchise. With PES 209, Konami are looking to build on the improvements they’ve been making over the last two or three years to the on-pitch action of the game, while they are also looking to expand the roster of licenses in their game by adding official licensing for multiple domestic leagues (though they have ended their partnership with UEFA). 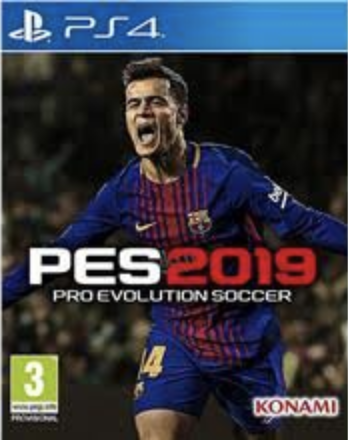 Phillippe Coutinho is going to be this year’s cover star for PES 2019, while David Beckham will take the centre stage on the front cover of the special edition of the game. As has been the case for a handful of years now, Pro Evolution Soccer 2019 will be running on Konami’s very own Fox Engine. They are looking to make a number of improvements to the game’s visuals aspect. Notably enough, the game will support HDR, while on the PS4 Pro, Xbox One X, and PC, it will also feature 4K support. In general, barring these potentially exclusive upgrades, though, Konami are still making a number of improvements. Lighting and shadows are going to receive upgrades, which means stadiums, players, jerseys, pitches, and more will look closer to how they actually look in real life. 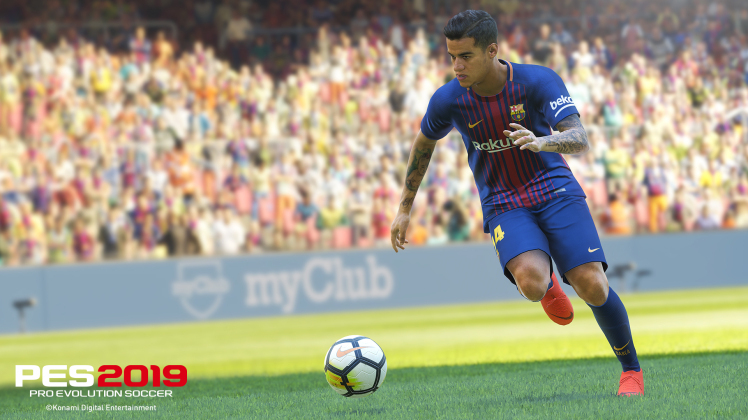 One of the biggest developments surrounding Pro Evolution Soccer 2019 in the build up to its launch, however, has been related to licensing. For ten years, UEFA and Konami have had a licensing partnership, as part of which all UEFA competitions, including the Champions League and the Europa League, have been exclusively featured in Pro Evolution Soccer titles. However, after Konami decided not to renew that deal and UEFA instead went into a partnership with EA Sports and FIFA, those competitions won’t be featured in this year’s game any longer. Which, obviously, is a real bummer for a lot of people, since there are many who felt that UEFA licenses were one of the biggest (and few) edges PES had over FIFA. In spite of losing a major, major license, though, Konami are still looking to make up for that. Many might call it a case of quantity over quality- call it what you will, but Konami are still looking to expand the overall number of official licenses in their game. As such, Pro Evolution Soccer 2019 is going to include licenses for many official domestic leagues around the world that were not included in its predecessors. These include- the Scottish Premiership, Portugal’s Premiera Liga, Belgium’s Jupiler Pro League, the Danish Superligaen, the Russian Premier League, Argentina’s Primera Division, and Sweden’s Raiffeisen Super League. When it comes to specific teams instead of larger leagues, though, PES 2019 is going to bring about some changes in terms of official licensing. For instance, German team Borussia Dortmund is not going to be officially licensed in the game. Konami had a deal with the club until quite recently, so it was initially going to be in the game, which is why see their stadium and their crest being featured in promotional material for the game so much. 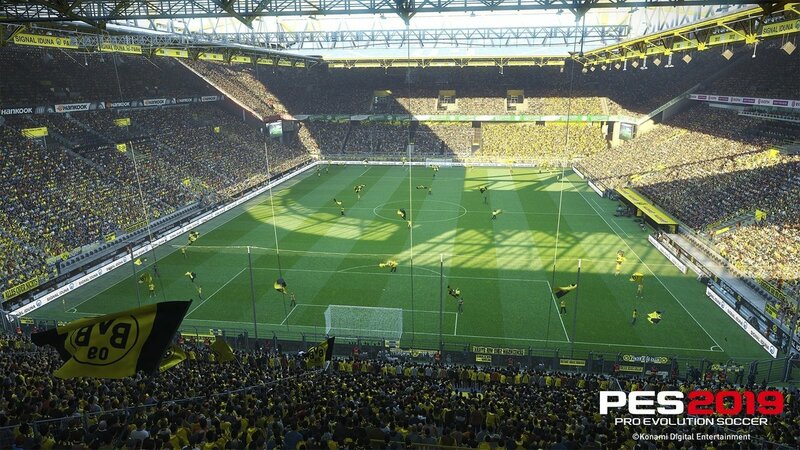 However, that deal was ended prematurely, which means Borussia Dortmund (or their stadium) won’t be in the game. Instead, as a replacement, Konami have signed a similar deal with fellow German club FC Schalke 04, who are indeed going to be officially licensed in Pro Evolution Soccer 2019, along with their stadium, Veltins Arena. Konami are going to use full 3D scanning technology to have better likeness for Schalke’s stadium, jerseys, and players in the game as part of this deal. Konami are going to introduce several tweaks and fine-tuning improvements to Pro Evolution Soccer 2019 to improve the quality of the moment-to-moment on-pitch action in the game. For instance, Magic Moments, a feature that they started building on with earlier instalments, will be more of a focus this year, while Konami are also looking to add more personality to the players in terms of how they play and animate. Their primary way of doing that is going to be through skills. PES 2019 will include a total of 39 skill traits for players, out of which 11 are going to be new additions. Among the new skill traits, goalkeeper specific skill traits include GK High Punt and GK Penalty Saver, while on the flipside, Penalty Specialist is also going to be a skill trait. Shooting related skill traits will impact rising shots, chip shot control, and dipping shots. Meanwhile, things such as interceptions, no-look passes, and cross over turns are also going to be governed by specific, newly-introduced skill traits. The remaining two new ones are Double Touch, and Step On Skill control. Movement in general is going to be improved in PES 2019. Konami have, first and foremost, made tweaks to the physics of the ball itself, to make its movement more natural and varied. Things such as the ball’s trajectory, its speed, and its position will all be governed by how it was kicked, and what the posture of the kicker was. Meanwhile, in situations where the ball bounces off of players or other surfaces, animations and outcomes are going to be more realistic. Players themselves are also going to move more fluidly and organically, and improvements have been mode, most of all, to dribbling animations. Part of that is full body touch, a feature that was introduced last year and is going to be built on this year, as part of which how a player interacts with the ball and how he traps an incoming ball is all based on his positioning, the ball’s speed, and other similar aspects. 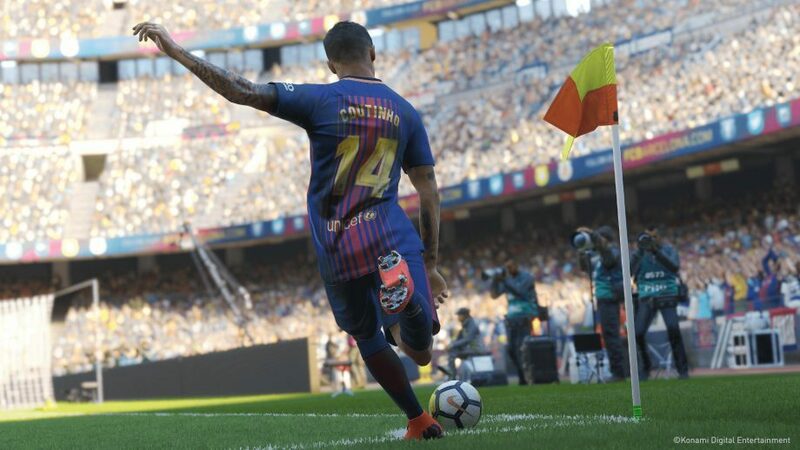 PES 2019 will also be making changes to the shooting mechanics. Most of this seems to be reliant on a more varied set of possible animations to make things seem more authentic and realistic, such as goalkeepers narrowly missing saves for some shots, players reacting more realistically to missed shots (also based on how close they were), and conversely, players reacting with more excitement to successful shots that get converted. Another addition that has been made to the game is that of quick subs, something that was actually introduced in FIFA last year. Thanks to quick subs, you can now make substitutions during matches while play breaks with just one click of a button, rather than having to pause the action and go into menus. Visual fatigue is also a major new addition this year. As a result of this new system, when players become fatigued or tired, they will show clearer and more realistic visual indicators of their conditions, which should, logically, affect their performance on the pitch as well. Meanwhile, the myClub mode (which is essentially PES’ variant of Ultimate Team), is also going to receive an overhaul that will involve a new card system and new ways of building your squad, though what exactly these changes will entail isn’t something Konami have divulged yet. We do know, however, that players’ form and performances will likely mirror their current real life form. Finally, improvements are also being made to Master League, which is PES’ career mode. For starters, the pre-season cup competition known as the International Champions Cup is going to be included in the game, officially, and will be part of the pre-season in Master League as well. Additionally, improvements are also being made to negotiations and transfers to make them more interesting and realistic. For instance, things such as sell-on clauses, a clean sheet bonus option, and deeper budget management have been added to add more nuance to the management side of things. Note: This wiki will be updated once we have more information about the game.